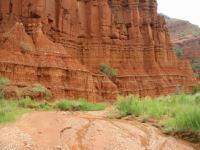 This is a beautiful place to camp, hike and ride. 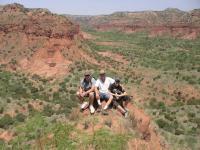 I lived in the panhandle of Texas for 47 years and some of my best memories are the times we spent in the canyon. We have driven 60 miles in the snow to get to the canyon to see it in it's most awesome glory.....covered in snow!! 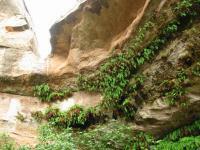 ONLY 2 WARININGS: LEARN TO RECOGNIZE POISON OAK AND IVY AND STAY OUT OF IT AT THE FERN CAVE!!!! It is all over the place.....and one other thing....TAKE LOTS OF WATER!! I have only just started hiking. 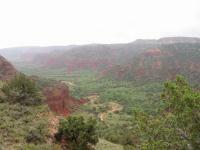 But this was a great hike with great views and diverse geology. 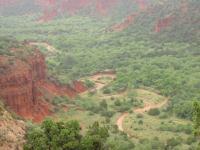 I hiked the 7 mile loop highlighted in the hiking texas book. This is a rails to trails that goes through a really neat tunnel with bats. We only did 8 miles of the 50 mile road and then retraced our steps.